Making-Healthy-Choices e-Zine #013 - How to Vote (the healthy way). Here in the US, it is stifling how much political campaign antics are around us now. It seems everywhere you turn there is another ad, billboard or commercial to view. But no matter what they tell you, a vote for any of them is NOT the most important vote you make. The most important vote you make (anyone in any country) is one that you do several times a week. It is the vote that you cast any time you purchase a product with your money. We are in a day and age of big companies and corporations whose bottom line is money. If we buy their products they survive and gain more power ... if we don't buy their products they shrivel and die off or change to try and adapt to our taste. Every time you spend your money on a product, you cast a vote. Companies watch what we buy as they do their market research. Every purchase you make is a powerful vote. Cast these votes wisely - shop with awareness. Only buy products that you truly want to support. Only buy from companies that you truly want to support. When you go shopping look at the array of products available and buy the healthiest ones you can find (healthy for you, your family, your community and your planet). If you are reading this newsletter it is because you are passionate about being healthy. Make your voice heard... make our world a healthier place for all of us by shopping with awareness. This really is important and the more of us that do this, the quicker we will see the changes happening. Lead by example, teach your children ... be the change you want to see. Fresh green juices are an amazingly healthy thing to add to your days. The biggest question I get when people are just getting into juicing is, "What should I juice?" I like to keep things simple and I really don't like following recipes and my answer follows along these lines. Always have some dark green leafy vegetables in your juice and then add whatever else is in season, looks fresh and is easy to find. With the dark green leafy vegetables do the same thing - buy what is in season, what looks fresh and what you can find. There are so many tastes in the fruit and vegetable kingdom that the juicing variations are endless... simply play and have a different juice every day if you like. Let your taste buds and your body guide you. Take a little taste of something before you use it for the first time. Let your taste buds inform you as to whether you like this particular ingredient or not. If it taste great to you, put lots of it in. If the taste is a turn off for you, put very little in or leave it out. And most importantly, always rotate your greens. Don't use the same ingredients every day - this is not healthy and will cause your body to build a resistance to those foods. Instead play around and always try new juicing combinations. Don't be afraid of failure. Even the most experienced juicers will come up with some very hard to drink concoctions from time to time. One time we didn't do the taste test mentioned above and put a whole load of mustard greens through the juicer. The result was a juice that tasted like horseradish and wasabi!!! A simple taste of the mustard greens at the beginning would have easily told us that very little or none of this green would have been much better. On another occasion we got creative and thought we would juice fresh okra. Well, because okra is extremely mucilaginous, we ended up with a green slimy sludge that tasted okay but the texture was very hard to take (imagine drinking raw eggs). For example recently we accidently juiced some hot peppers thinking they were sweet peppers and we ended up with a spicy green drink that we totally loved the taste of. So now we are putting hot peppers in our drinks often. The moral here is play and create. 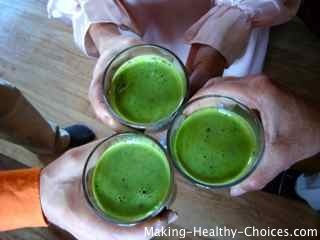 Make juicing a fun part of your day and a fun way to explore fruits and vegetables that you are not too familiar with. This is a wonderful movie about a world class gymnast that loses his way and is guided back with the encouragement to look within himself. There is a powerful message in this story for each one of us, adults and children alike. Grab a copy of this entertaining and uplifting movie, gather your friends and family around and enjoy it together. To read more reviews and/or to purchase this wonderful movie, click here. Last month I gave you a recipe for a delicious Blood Building Juice. One of the things that came to light from the analysis of my recent blood tests (which was what prompted the creation of that blood building juice) was that some of my hormone levels are low. Maca is an ancient food that is known to work well with balancing hormones as are almonds. 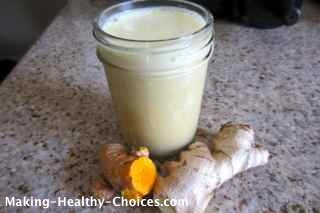 Ginger and turmeric are adaptogenic herbs meaning that they synergistically increase the properties of other ingredients. Not everyone will enjoy the taste of this drink but if it sounds good to you it is probably because these are things that your body needs right now.